This bundle includes (4) items: "Holiday Baubles," "Christmas," & "Christmas 2" glass etching stencils under brand name Over N' Over and 1 free How to Etch CD-ROM eBook with each purchase. Includes patterns for computer use only. These reusable stencils are great for decorating your painting or etching projects. The package designs consist of the following for each size. Holiday Baubles: Santa and sleigh: 4.0 x 1.0", PEACE: 1.0 x .5, Thanks 2.25 x 1.0", Individual reindeer1.0 x 1.0" use them to add to the Santa/sleigh, Snow flakes: 5/8 x 5/8" Christmas: Bells- 1 x 1", Tree- 2 7/8h x 1.5 w, Small; Bow- -.5 x .5", Lg Bow- 1.5 w x 1.5" h, Snowman- 3.5 h x 1.5" w, Wreath- Outside dia 1-7/8, Inside dia 1-1/8". Christmas 2: Candy Cane 1.5 x 2", Poinsettia 2.25 x 2.0 ", Stocking1.2 x 2.75", Ornament 1.5 x 2.0", Bell 1.5 x 2.0", Holly 2.0 x 1.5"
Etch or paint stencils of Christmas designs on nearly anything easily! These adhesive-backed Christmas themed stencils reduce frustration in having to cut and adhere them. 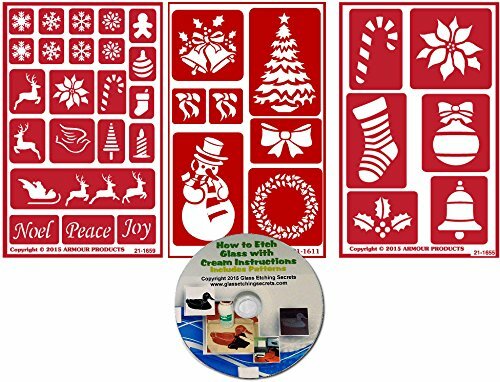 Includes 35 total stencils of snowflakes, reindeer, dove, candy cane, stocking, bells, bows, tree, snowman, wreath, poinsettas and holly leaves. Reusable, flexible, self stick adhesive-backed stencils can be used many times to save you money!